You’ve read about the benefits of journal writing and still haven´t started? Here are some inspiring tips and ideas for the productive Muslim on how to get started and keep going. As Muslims we’re encouraged to reflect upon ourselves and our lives, and continuously strive for improvement. It allows you to reconnect with yourself and your life: In our hectic day-to-day lives, many details simply get lost, somewhere between breakfast and bedtime. Taking some time each day to sit down and write about your day makes you more aware of what you’re thinking, feeling and doing. And the first step to improvement is always awareness. It helps you see the bigger picture and discover patterns in your life: When you journal for some time, you will find it much easier to connect the dots and recognize the patterns in your life and your relationships. Reading back earlier journal entries can be a real eye-opener and gives you insight about where you’re coming from and where you’re heading to. It enables you to diffuse negative feelings and attitudes: Sometimes you just need to let off steam about something that happened to you, or perhaps you struggle with negative feelings and thoughts that hold you back from being productive. Writing about it can be an enormous relief and it can help you to let go of the negativity and focus on being positive and productive. The key to upholding any good habit is motivation. If you lack motivation, whether it is for journal writing, exercising, or getting up for Fajr, it is very unlikely that you will keep up the habit. You should keep in mind that journal writing can be so much more than ‘keeping a diary’, and that there are no fixed rules for journal writing. Feel free to experiment and find the style of journal writing that you are comfortable with and that keeps you motivated to get out that pen and notebook regularly. While some people can sit down every night in front of a new, blank page and write dutifully about everything that happened during the day; others may write a few entries and then store the journal somewhere on a shelf. 1. Start a theme-based journal: Focus your journal writing around a theme that you want to reflect on. Your health habits for example, or your children’s development. You could also keep a spiritual journal, where you reflect on your growth in Islam, and the signs and favors of Allah. When you are blessed with the opportunity to travel, or make Hajj or Umrah, keeping a travelogue will help you to reflect on all that you see and encounter. 2. Do it together: Journaling together can be a great communication booster. Write a journal together with your husband or wife, sharing your thoughts, and be surprised at how much insight you both gain from this! If you have children who are old enough, you can also involve them, and keep a family journal in which everyone has the chance to contribute. Such journals help strengthen the family bonds, and they are a priceless source of smiles and memories in the years to come, Inshallah. 3. Get creative: Use colors, doodle, make sketches. Write upside down, or in a spiral. Copy inspirational passages from books you have read. Stick in pictures or artwork of your own. Make it fun! 4. When and where: Who said you need to sit down on your bed or at your desk at the end of the day? 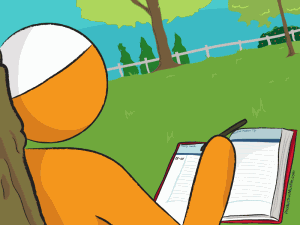 Why not take your journal to the park on a beautiful day? Or write early in the morning, after you’ve prayed or read Quran? 5. It’s not about the paper: Use the resources that work for you. Some people like to write the classic way; leather-bound notebook and fountain pen. Others like the space of a generously sized sketchpad. You might want to carry a small notebook in your bag, so you can write wherever you want, or use a loose-leaf journal. For those who prefer writing on a computer rather than in a notebook, you can keep a journal online, use journaling software, or specially designed apps for your smartphone or pad. The possibilities are endless. So, how about getting started on your journal today? Jump-start your habit by dedicating time for it. Get your Productive Muslim certified Lifebook now! Take your journal writing to another level. Read this article to learn about apps for digital journalizing.